Cast: Ewan McGregor, Hayley Atwell, Bronte Carmichael, Mark Gatiss, Jim Cummings, Brad Garrett, Nick Mohammed. 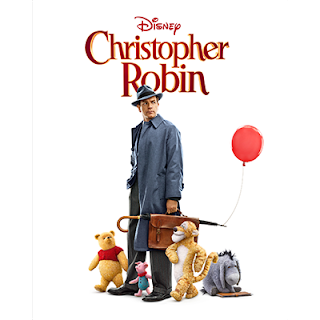 Christopher Robin is an emotional, feel-good stroll down memory lane with a just above average quality in its technical aspects and a message that could be easily misinterpreted, depending on its viewer. Summary: Like its 80s and 90s Winnie the Pooh cartoons, Christopher Robin is a story of the titular character and his playfellows of the Hundred Acre Wood. In this live action adaptation, however, Robin is all grown up and married with a child and due to a series of unfortunate events (including a war) has developed a hectic and cynical outlook on life that bleeds into his relationship with his family, especially his daughter. But with the help of Winnie and the other forgotten inhabitants of the Hundred Acre Wood, along with some quirky misadventures, Robin is led back to understanding the things that should matter most in his life. The main plot of Robin rediscovering his simplistic and optimistic view of life is assisted by three subplots in three settings: one is of his work where he has been tasked with a budgeting conundrum; the second is of his family that he has neglected because of the stress of his job; the third is of Pooh who has lost all his friends from the Hundred Acre Wood and needs help finding them. Though the three all come together to produce a satisfying conclusion, the third goes on a bit too long and is in itself not very well done, mostly coming off somewhat schmaltzy though it’s also peppered with a bit of heart and showcases the best chemistry between Robin and Winnie. It’s the first and the second coming together that works most and gives the plot a well enough balance to stand on. The titular character is an interesting and a quite realistic study of how the vicissitudes of Life changes a child as he grows into a man. Although it’s hard to say it’s something new on the silver screen, it’s certainly a different and welcoming portrayal of the character we (those who’ve seen the old Winnie the Pooh cartoons) know and love. His circular arc, though easy (without being lazily written), is a complete one and is the main focus of the plot. The supporting characters are there to help the realization of his arc and in that respect, they succeed, but only Robin’s family, his wife and daughter have their own fully developed arcs. The members of the Hundred Acre Wood also have a collective arc but it feels forced, like an afterthought rather than organic, and so they don’t get as much to do as they would’ve liked. Ewan McGregor plays a wonderful believable Christopher Robin with the dour complexity of a workaholic adult and the carefree simplicity of a child in equal measure. Haylee Atwell’s Evelyn plays a reliable buffer between Ewan’s Robin and his daughter Madeline and gives motherly advices to both and her performance was laudable. Bronte Carmichael’s Madeline offers a good foil for what Robin is overlooking in his life, literally and metaphorically and plays her role convincingly but her best moments come from her scenes with the members of the Hundred Acre Wood. Concerning them, the voice cast of Jim Cummings (Winnie the Pooh and Tigger), Brad Garrett (Eeyore) and Nick Mohammed (Piglet) are perfection and they bring the characters to life. Peter Capaldi’s Rabbit, Sophie Okonedo’s Kanga, Sarah Sheen’s Roo and Toby Jones’ Owl have only a handful of scenes and aren’t distinguishing performances. Mark Gatiss’s Giles Winslow is a snarky antagonist but comes off as awkward, even bumbling, rather than genuinely threatening and is quite forgettable. The structure of the story feels a little lacking at times. The early rundown of Robin’s career is shown in chapters which feel more like an homage to the books than serving the movie and are quickly dropped when the movie gets into the thick of its plot. Some important points of the movie also feels too convenient and lazily written and parts of the dialogue tend to come off being cheesy. The writing is one of the weaker aspects of the movie and is papered over by directing and editing. Christopher Robin’s world experiences a continuous transformation in tandem with the protagonist’s. There’s a bit of color and vibrancy accompanying the movie’s upbeat moments, the early and ending Hundred Acre Wood scenes, but majority of what goes on between is a more muted affair. The scenery of the Hundred Acre Wood doesn’t quite capture the stylistic beauty and magic of the old toons and the movie glosses over its wartime set pieces without fully capturing the raw aesthetic and emotion of those darker periods, but maybe that is to serve its target audience more than anything. At the very least, it gives a convincing reason for Robin’s transformation. The other settings, like the factory and either of Robin’s homes are standard affairs. On the character side, the design shines through. Winnie and his friends are vibrant and well animated. The costuming of the human characters also tend to represent their time and place. Marc Forster deserves praise alone for deciding to tackle an older Robin which he does well enough. His focus on the older Robin makes for a compelling character but his primary theme of reconnecting with your loved ones is almost displaced by a message—“Doing nothing leads to the best of something”—that might not go well with contemporary parenting. But you sense the kids will be murmuring that in their sleep. The editing is one of the strongest aspects of the movie. Every scene flows smoothly and transitions easily from one to the next and seems to serve a purpose. Emotional scenes are squeezed for every penny’s worth. This helps give the movie an overall steady pacing. The warm, soft score accompanies vital scenes that elevates the emotions the director was seeking to convey, and the occasional quirky beat punctuated the odd amusing scenes as well, especially when Madeline races back to her father’s office to deliver his documents to him. Many of the scenes with Christopher and Winnie in London are scored with the theme song of the cartoons and when Tigger does his rendition of his theme, the nostalgia is through the roof! Altogether, Christopher Robin offers an alternate perspective on the beloved character and with an emotional and nostalgic core, coupled with good directing and editing that elevates an inferior screenplay. P.S. : I’d love to know if Robin took Cecil on his gin rummy proposal.